President Muhammadu Buhari has reacted to the death of Kolade Johnson, the man who was killed by the SARS operatives in Lagos on Sunday. 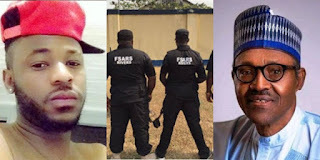 The President in his reaction promised that indicted officers will be prosecuted, while also acknowledging the genuine outrage of Nigerians as regard the activities of SARS operatives. The recent unfortunate action of SARS operatives from the Lagos State Police Command, which led to the avoidable death of Mr. Kolade Johnson, is deeply regretted. Once again, our condolences to the family of the deceased. I’m aware the Police authorities have visited them. I acknowledge the genuine outrage from citizens and Civil Society groups regarding the activities of SARS. As you’re aware, the Suspects in the Kolade Johnson killing are in custody. When the orderly room trial is concluded, indicted officers will be prosecuted in court. While important steps have been taken by the Police leadership to restructure and reform SARS, in line with presidential directives, more needs to be done. I assure this will be done. We will continue to work to ensure that we have a Police Force that adheres to the rule of law.